So often it is the usual headline makers that are once again grabbing the attention when Ashes’ series get underway. Shane Warne, Andrew Flintoff, Kevin Pietersen, Glenn McGrath, a few that have dominated the back (and front) pages in recent years, prior to that a glamorous list that includes names such as Botham, Lillee, Larwood, Laker, Bradman, Border, Hobbs, WG Grace, etc. When England needed a hero in the opening Test of the 2009 Ashes series, Paul Collingwood stepped forward and played an innings in a situation that was tailor-made for his character. It was a backs-to-the-wall scenario, one that Collingwood has thrived on throughout his career, a real scrap, pressure-cooker environment, and he wasn’t found wanting. That he was dismissed before he had completed the rescue mission should not take away the efforts he put in on that final day in Cardiff. While England celebrated an unlikely Lords victory (when 1934 is the last time success is enjoyed at a ground, you do begin to think) in the second Test to give them a 1-0 lead, Collingwood reached a landmark of his own, collecting his 50th Test cap for England. As ever, this passed under the radar, as does so much of what Paul Collingwood does, but that is not to say his role is any less important in what he does for the side. ‘Colly’ is not a box office attraction such as Kevin Pietersen or Andrew Flintoff, he is not as technically outstanding to watch as an Ian Bell or a Michael Vaughan, he has never enjoyed as much natural talent and a certain destiny to succeed as an Alistair Cook. He is not the clever boy who need not revise, he works hard to make the most of the talents he has. But Collingwood doesn’t care much for what he isn’t. He is immensely focused on what he does do and his batting reflects his ability to play within his limitations, knowing how he is going to succeed on a given day, scrapping for everything, this has generally been the story throughout his 50 Test appearances to date. He made his Test debut back in December 2003 when England were set an almost impossible target of 323 at Galle on the final day against a Sri Lanka side including Muttiah Muralitharan. England never threatened to chase it down, but Collingwood batted for just under three hours (making 36 off 153 balls) to repel the threat of Murali and co. and help England save the Test, they finished on 210-9. Since then Collingwood has recorded a number of fine knocks. The winter of 2005/06 when he ‘arrived’ as a Test player, following tours to Pakistan and India (he made 96 and 80 in Lahore, and a maiden Test century, 134* in India), his monster effort at Adelaide in the damaging Ashes series in 2006/07 where he made 206, and his 135 against South Africa at Edgbaston in 2008, under immense pressure for his place in the side. The man seemingly pigeon-holed as an ODI specialist was in fact a pretty good Test player as well. It is his knock against South Africa that demonstrated everything about Collingwood. After 24 innings without reaching three figures, and only spasmodically displaying his true capabilities, the selectors finally lost faith. He failed in the first Test of the series at Lords against South Africa and lost his place, but he was for the third Test when a change in the side’s make-up, opting for four specialist bowlers as opposed to five, meant Collingwood had a reprieve. He was under no illusions he must succeed in this Test, his first innings failure simply intensified the pressure, but a second innings knock of true grit with his Test career in the balance, ensured every single English cricket fan wore a huge smile when he brought up three figures. Every side needs a man that enjoys a battle, relishes a challenge. 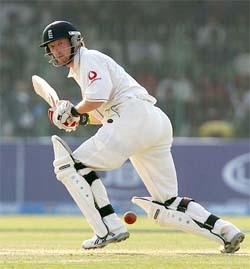 These days he forms an integral part of England’s middle order. There is no better man to have striding to the middle when your side is in a crisis than Paul David Collingwood. His style, while not aesthetically pleasing, is effective. His movements prior to the ball being delivered are minimal, his backlift low, yet he has manufactured a way of playing that works for him. As strong as most through the midwicket region, constantly working the ball off his pads and hips against bowlers that stray too straight. An area bowlers have had success is in the corridor outside his off stump where Collingwood has been known to push out at. You can rest assured he’ll be working all hours to iron out his flaws in this area. Will Australia be able to exploit areas they see as perceived weaknesses – At the moment they don’t seem to have the answers, Collingwood has registered three half centuries in four innings in this series so far, and looks in fine fettle. A player with the metronomic accuracy of a fully fit Stuart Clark, plugging away on the off stump line with added bounce to trouble his low backlift may be cause for some watchful cricket by the England man. Perhaps this series will produce the unsung hero. Since he regained his place against South Africa in July 2008, the Durham man has scored 1,055 runs in 13 Test matches at an average of 62.06 (including four centuries). In today’s world where one-dimensional cricketers are being cast aside, Collingwood has numerous strings to his bow. His slip catching is safe, the ability to pull off catches very few even dream of. Comfortable also in the point/cover region where he spends most of his time in one-day arena. His bowling is at times under-used, but he offers a handy option with some medium pace swing or depending on the track, an offering of cutters. But it is with the bat where he specialises, and one hopes now with his recent form, that his position is seen as secure, despite the constant speculation that has unfairly clouded his place in the team. He refused to let Australia run through England on the final day of the opening Test, just as he so stubbornly refuses to allow his place to be taken by any new challengers. Paul Collingwood is constantly in battle, and that’s just the way he likes it. Great read. Colly is actually having a fine series to far, averaging around 60, three fifties in four innings. Representing your country in 50 tests in no mean achievement. Glad it is being acknowledged. Well done, Colly. Yeah Collingwood has had a good series so far, we probably wouldn’t of managed the draw in the first test without him. No probably about it tbh. Never liked Collingwood that much really, but doing a darn good job at the mo. Just hope he doesn’t run into a rough patch for the rest of the series. That effort in Cardiff made Colly for me. I finally forgave him for Adelaide! He needed forgiveness for scoring 228 runs for once out in a losing cause?